PM Netanyahu to reporters in Washington: We don't want to control the Palestinians, but we will not give up our security. 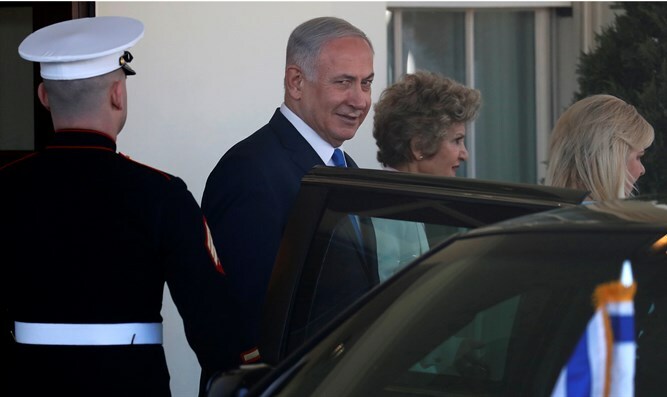 Prime Minister Binyamin Netanyahu on Tuesday sat down in Washington for a talk with 12 American reporters at Blair House, the official guest house of the White House. The event was attended by reporters from the New York Times, the Washington Post and other local broadcast networks. Netanyahu refused to answer questions about Israeli politics and about his former adviser Nir Hefetz becoming a state witness. The prime minister was asked by the reporters whether he believed in a two-state solution in order to bring an end to the conflict between Israel and the Palestinian Arabs and replied, "I haven't named it. But I've defined it." Netanyahu explained that Israel did not seek to govern the Palestinians but that Israel must retain overriding security control of Judea and Samaria, noting the Palestinians are not capable of rooting out violence. "There is no ability by the Palestinians to deal with these things. Who does the job is the Israeli security forces," Netanyahu said. "You can say it will be good if we give them a state ... empirically it doesn't work with what we see." At his speech at the AIPAC Policy Conference a day earlier, Netanyahu said the Palestinian Authority’s (PA) leadership must end its policy of funding jailed terrorists and make a serious commitment to peace for a final status agreement to be achieved. “I have a message for President Abbas: Stop paying terrorists. Because what message does this send to Palestinian children? It says murder Jews and get rich. And I believe President Abbas should find better use for this money—to build roads, schools, hospitals, factories. Build life, don’t pay death. Invest in life. Invest in peace,” said the prime minister.